Whether you're running behind and don't have time to shop or just want to add that homemade touch, these printable paper boxes are fabulous for gifts, party favors, decorations, or other containers. Your imagination's the limit! In most instances, you can right-click on the image and choose to save it or print it. Print the template onto a full sheet paper. Cut the template out on the black lines. Glue the flaps to the inside of the box so no one can see them. Do not glue the top flap if you want the box to be able to open and close. The choice of paper that you use will determine how sturdy your box will be. You can make decorative boxes from regular paper, such as for Christmas tree decorations or strings of party decorations. For gift boxes, however, it's best to use heavy construction paper, card stock, or even cut them out of cardboard, foam board, or styrofoam. If you are going to make a box from a material too thick or stiff to run through your printer—for example, foam board, card stock, cardboard, or styrofoam—you could print out the template and tape it to the stiffer material and then cut the template. If you make a box from cardboard, you could use it as a shipping container. This is a thrifty option if you have cardboard at hand that would otherwise be recycled. You don't have to pay for a shipping container or find one that can be reused! The printable square box template is also a good way to use leftover sheets of styrofoam. You can turn them into decorations or use them as gift boxes. This is a nice option as it is often difficult to find a recycling center that takes styrofoam. Turn your trash into treasure! The square box template can be enlarged and printed onto multiple sheets of paper if you want to make a larger box. You can often change the size of an image with your photo management software. Select a larger size but keep the dimensions the same. Don't accidentally make it taller or wider out of proportion, though, or it won't fold into a box that is square. Remember, when printing a size larger than the paper in the printer, allow it to print on multiple pages rather than being "print to fit" on a single page. To use the multiple pages, carefully cut them out and tape them together where they match up on the multiple pages. 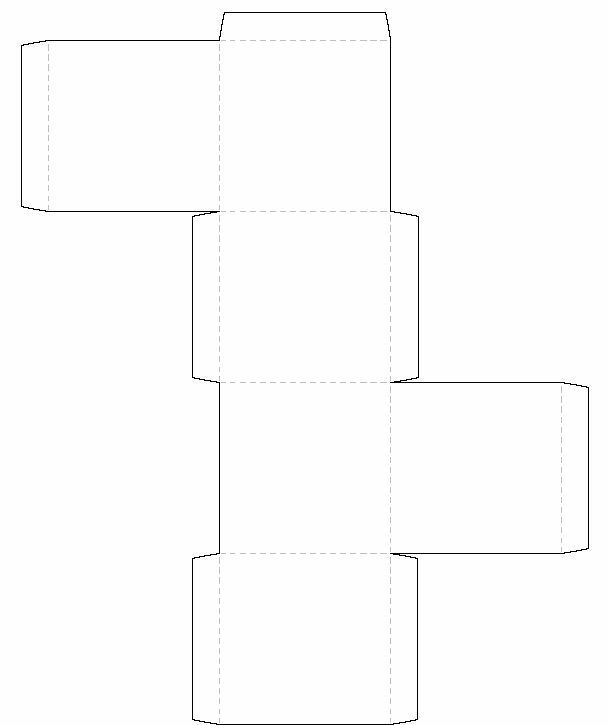 Now you have a larger template you can use to cut the foldable box from a larger piece of cardstock, poster board, or cardboard.